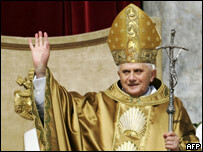 Pope Benedict XVI has been formally installed as Pope in an open-air Mass in St Peter's Square in Rome. The Pope has been presented with the symbols of power the Papal ring and the pallium - a narrow stole of white wool. During his sermon the new Pope reached out to Jews and called for unity with other Christian denominations. The open-air service is being attended by political and religious leaders from around the world along with about half a million pilgrims packing the square. The two-hour inauguration ceremony began with the 78-year-old German Pope and the Roman Catholic cardinals processing to the site of St Peter's tomb, underneath St Peter's Basilica, to pray. The Pope, dressed in a gold robe over sacred white vestments, then emerged from the church into the sunshine of St Peter's Square as a choir sang the Laudes Regiae, a litany calling for divine assistance for the new Pope. 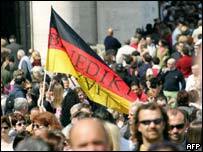 The crowd of pilgrims applauded loudly as they saw Benedict XVI, waving flags, many of them German ones, and cheering. "I am not alone. I do not have to carry alone what in truth I could never carry alone. "All the Saints of God are there to protect me, to sustain me and to carry me. And your prayers, my dear friends, your indulgence, your love, your faith and your hope accompany me." Speaking of the challenge ahead of him, the Pope said his primary role was not to present a programme of governance to the Church and to pursue his own ideas, but to listen to the will of God and be guided by it. As well as being steeped in tradition the ceremony contained new elements - in a break with previous papal installations the attending cardinals did not kneel before the Pope and pledge obedience. Instead this ritual was carried out by a group of 12 people, chosen to represent the diversity of the Church and the 12 original apostles. The group is comprised of three cardinals, a bishop, a priest, a deacon, a married couple, a nun, a monk and two young people who have received the sacrament of confirmation. The service will end with the "Urbi et Orbi" ("To the city and the world") blessing pronounced by the Pope in Latin. In centuries gone by, the new pontiff would be crowned with a special tiara and carried around the square in a wooden chair, but this ritual was abolished by Pope John Paul I. After the mass, Benedict XVI will be driven around in a car, which the Vatican has already announced will be different from the one used by the late John Paul II and known as "popemobile". Thousands of Germans have flocked to Rome over the past few days, eager to see a fellow countryman mount the throne of St Peter for the first time since the mid-11th century. Volunteers from Italy's German-speaking areas have been on hand to welcome them. The Pope's elder brother, 81-year old Reverend Georg Ratzinger, is also attending the inauguration along with German Chancellor Gerhard Schroeder and President Horst Koehler. Other heads of state and government include French Prime Minister Jean-Pierre Raffarin and Spanish King Juan Carlos. US President George W Bush is represented by his brother Jeb, the Florida Governor, who leads a delegation of 21 members of Congress.